Some software developers try to monetize freeware by bundling it with PUPs, hijackers, and even malware. Others try to trick you into clicking a download link that doesn’t download the program you think you’re getting, but malware instead. Some developers just give away freeware – no strings, no PUPs, no bundles, just the goodies. So, you can be clever and keep your name to yourself and give sites a throwaway email address so you don’t end up getting newsletters or sales pitches you don’t want. And let me say that it’s been a week since I’ve installed software from this site and I’ve not yet seen any sales pitches or annoying emails – the only emails I’ve received were the emails with registration keys and download info. However, your experience may differ. Now that we have all that out of the way, let me say that this company has been around for a long time. Back in our Cloudeight Stationery days their software CDs were popular in stores. Oh! How the world has changed. The company is Serif and they make a lot of good software related to scrapbooking, desktop publishing and photo editing. They tend to give away older, but still useful, versions of their software – and/or feature-limited versions. We’ve tried a couple of them, and we think many of you will find their free products useful. CraftArtist Compact is available to download FREE from our dedicated digital scrapbooking site DaisyTrail.com. Download CraftArtist Compact now and you’ll soon be able to create beautiful digital craft projects without having to spend a penny on materials or wasting any time. This version is 100% free and is yours to keep! Create pixel-perfect web buttons with rollover graphics that are HTML embedded as well as Flash banners that will instantly grab the attention of your visitors. Use keyframe or stop frame methods to capture movement frame-by-frame. DrawPlus X6 includes a wide selection of watercolour, pastel, charcoal and other realistic-looking brushes. Photo-quality spray brushes allow you to add paint splats, glitter, flowers and many more decorative effects. Achieve colour consistency across all the media you design and build up designs with layers. Enjoy creative options like Blend Modes and apply non-destructible Graphic Styles that make your designs stand out and shine. Express your creativity for free! Straighten and crop your photos to fit frames and collages and create stunning gifts or souvenirs. Create perfect photos with tools for removing red-eye, blemishes and adjusting brightness and colours. Easily remove scratches, unwanted marks and creases with powerful Clone and Scratch Remover tools. Descriptions (above) of the software products are from Serif. There are even more free programs on this site -so you might want to check them out too. 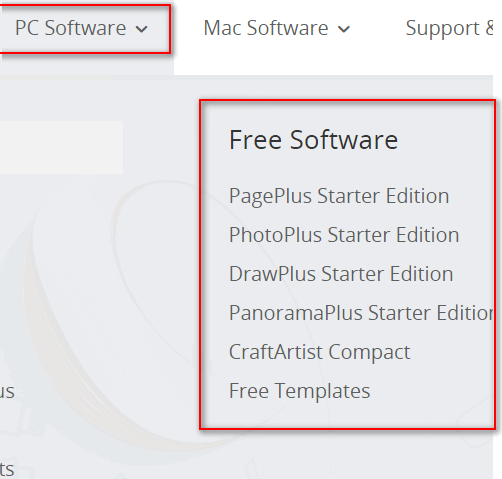 Just go to the Serif website and click on PC Software on the menu at the top, then under “Free Software” you’ll find a list of all the free software offered by Serif, including the ones listed in this post. In addition, Serif’s Video Editor, Movie Plus, is second to none. I’ve purchased and used Serif products for many years and have never had a problem with any of them. One of the features of Page Plus allows you to take a PDF file and fill in the blanks, or edit it as you see fit. Thanks for all the valuable info y’all provide! I have been buying and using Serif software since they were a startup company. They have great products and customer service. I also highly recommend recommend them. I have used their software also. Yet have received any unsolicited email, just email about other products they offer by my decision. OK. Tried to download. Seemed successful but was asked for a product number or somesuch and couldn’t proceed without it. Number not given so no FREE DOWNLOAD. Sigh. They send you a free registration key by email within a few minutes – if you follow the instructions and give them a real email address.